Posted: Sat Mar 14, 2009 1:05 am Post subject: Your future flights..
Just a thread to post your future or upcoming flights. 9. Not sure yet, gotta get back to DEL May 16th maybe KL or AI from CDG. Last minute booking, and the passport is still at the Swiss embassy for the visa, hence flying via Bombay to pick up the passport at the airport. Total ticketed price INR 54099. LH had only an expensive class (H) available for BOM-FRA yesterday, and suddenly today they opened up the very cheapest classes (W) on this flight as well. Probably a last minute attempt to dump the last few seats? Unfortunately for me, the travel agent had not ticketed yesterday, so now I'm stuck with W class (50% less miles), while my company's client has saved about Rs. 10K. I'm quite looking forward to the return leg on the 346 - love the 2-4-2 seating pattern, and have managed to get myself onto a window seat for that sector. PS: Looking for any tips on what to do or not do while in Geneva! Thanks - will definitely try one of those! Looking at the a/c config on Amadeus shows me this alternate 744 seating - with Y starting from row 28. All of LH's 744s (AFAIK) now have Y starting from row 31, so any ideas on this strange seating config? LH had only an expensive class (H) available for BOM-FRA yesterday, and suddenly today they opened up the very cheapest classes (W) on this flight as well. Probably a last minute attempt to dump the last few seats? It turns out that the LH 744 from BOM to FRA was 100% full in Y and J (did not go up to check out the F) - quite amazing for a mid-week flight during a "low period". Well a trip i am really looking forward it comes up in 36 days! I now have to figure out how to get to LHR from AMS! AY gave me re-routing as they pulled out of BOM. Woohoo - my first revenue flight in J !!! This worked out to about 106K/head (with the domestic sector on AI in Y). My colleague's ticket is at a much lower price due to the offer. Umm....have never tried a TR before! But i'll try this time! Are all 9W 737-700s equipped with PTVs? Maybe 737-700s operating on the BOM-DEL route might be having them? And are 9W flights operating out of the brand new terminal at DEL? And this is my first revenue J flight on LH! I don't know what's come over my company - they agreed to LH at 128K though AF was available on the same sector for 95K (all business class fares). BA was also 97K, but it probably required a UK transit visa, so it wasn't an option. This trip is tentative right now, and it's back to Y as this is a visit to a prospect! Do Report, Gentlemen, ifu have time that is. First time I'm using my EK FFP program to earn miles, as I have enough on my CO program to get me a single India-US return ticket, and don't think I'll be able to get to double that in any time . Nimish did you fly EK mainly for the miles? What was the price comparisons to BA/IT on the route? 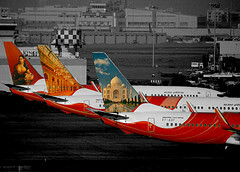 Hi Nikhil - I flew on EK mainly due to the ability to fly on a 380 . Besides IT/ BA were more expensive - about 49K on BA (though on Y+), and did not get a quote for IT. Galileo's e-Ticket's dont look quite as good as Amadeus's! Flight Operated By: UNITED AIRLINES INC.
Nimish, a TR would be nice. Killer deal - in what respect? This was an expensive fare - on H class - just 2 levels below full Y fare! Wow Nimish, you are gonna have a monster trip! All the best aircraft types thrown-in. Can we have a Pictorial TR atleast then..? Wow Nimish, seems that you are gonna have a good trip! Have fun mate! Pics would be really appreciated!